Georges Seurat went beyond the Impressionists by being among the first artists to make a systematic and devoted use of color theory. 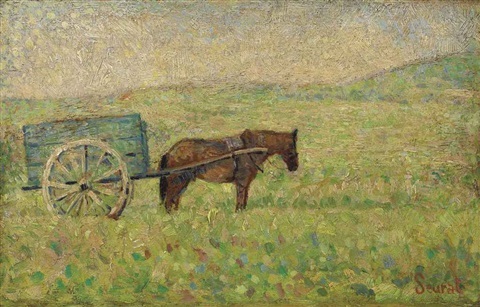 In 1886 the art critic Félix Fénéon named this style Neo-Impressionism in reference to the work of Seurat, Paul Signac, Maximillian Luce, and Camille Pissarro. 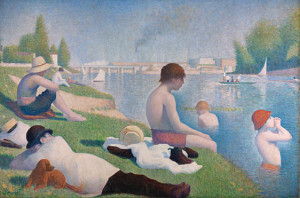 Seurat called his new scientific and optically based style Chromo-Luminarism. 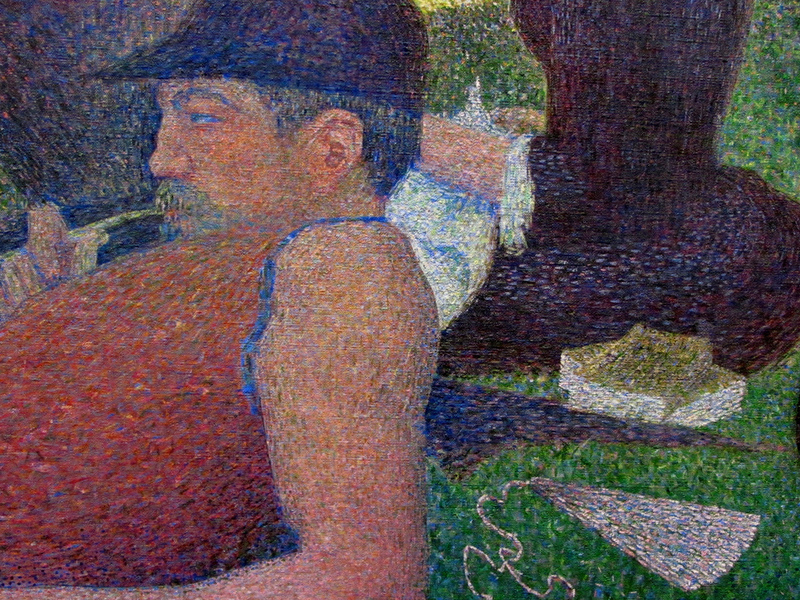 It is better known today as Pointillism or Divisionism. Instead of blending colors together on his palette, he dabbed tiny strokes or “points” of pure color onto the canvas. When the colors were placed side by side, they would appear to blend when viewed from a distance, producing luminous, shimmering color effects through optical mixing. His work showed perfect perspective and well arranged geometric compositions. His figures were proportioned classically based on Vitruvius with a Renaissance classicism inspired by Pierro della Francesca. 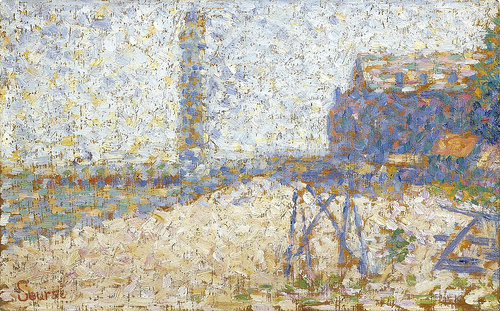 His themes portrayed the working class not the bourgeois of Claude Monet and the other Impressionists. Thus he returned to Gustave Courbet’s theme of social and collective meaning in painting. Seurat was only thirty-one when he died, however he left behind an influential body of work. In addition to his seven monumental paintings, he left 40 smaller paintings and sketches, about 500 drawings, and several sketchbooks, which will be explored in Part 2. 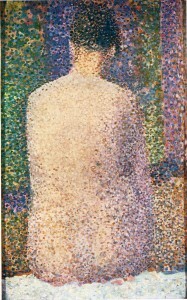 Though a modest output in terms of quantity it shows his unique innovation and future influence on Fauvism and Cubism. He also consequentially laid the foundation for 20th century Modernism as seen in the work of Picasso, Matisse, Mondrian, Miro, Albers, and Rivera. Bather’s at Asnières, (1884) is the first of Seurat’s seven monumental canvases and the culmination of his color theory research from 1881-1884. He drew contè studies (a mix of wax and graphite or charcoal) using live models and made small sketches on site to record the effects of light and atmosphere many of which have survived. 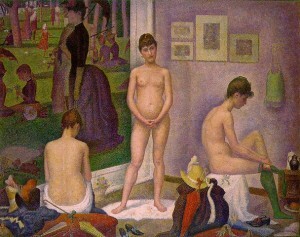 The final canvas was finished in his studio. It is largely rendered in criss-cross brushstrokes, a technique known as balayé. Seurat then re-touched the areas with dots of contrasting color. 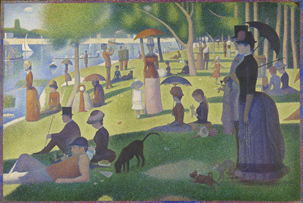 Next, Seurat began working on Sunday Afternoon on the Island of La Grand Jatte, which took him two years to complete and was based on countless drawings and over thirty oil sketches. This was the the first painting to be done in Chromo-Luminarism. It was exhibited at the the Eighth Impressionist Exhibition in May 1886 alongside the other Impressionist paintings. In terms of scale, technique, and composition it caused a scandalous eruption within Impressionism. However, it did establish him as the leader of the new avant-garde, Neo-Impressionism. Seurat spent his summers on the Normandy coast painting small marine paintings – Honfleur 1886, Port-en-Bessin 1888, Le Crotoy 1889, and Gravelines 1890. In Winter he would lock himself away in his garret studio in Paris and work on the large figure paintings to show in Spring. His last major works depict the Parisian nightlife, models and the circus. He had a studio next to Signac’s on the Boulevard de Clichy in Montmartre, where he was surrounded by artists such as Puvis de Chavannes, Degas, Gaugin, Van Gogh, and Toulouse-Lautrec. In 1887 Seurat began working on Les Poseuses, which was the last of the seven grand scale compositions. Although he was young when he died, he left behind an influential body of work that proved to have a lasting impact on the course of art. This was because he was one of the first artists to make a systematic use of the newly developed color theories and his technical innovations influenced many artists during his time and after. Europe at that time was in a degree of industrial and scientific change and through his art he reflected his times and the social and economic shift that was taking place. 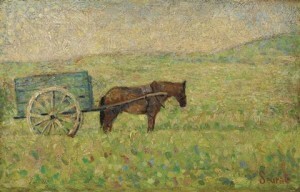 Attelage Rural, c, 1883 6 1/4 x 9 3/4 in.